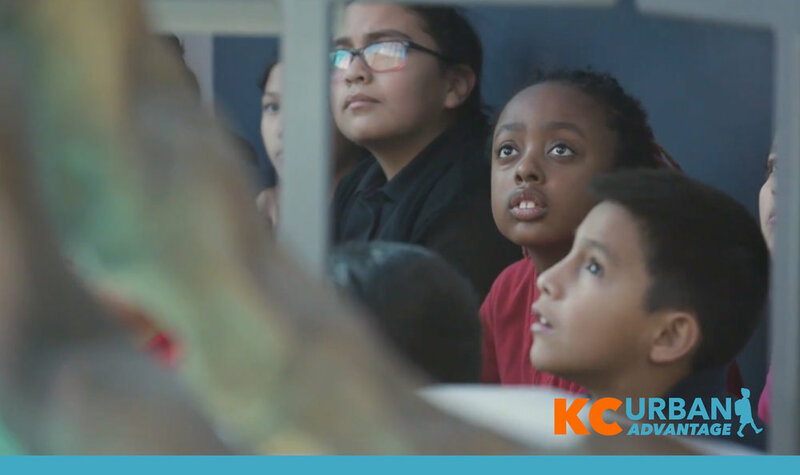 The purpose of KC Urban Advantage (KCUA) is to help break the cycle of poverty in Kansas City by increasing confidence and ability in academic achievement for underserved students. Our mission is to provide access to holistic STEAM education and unlock opportunities for higher learning and future STEM (Science, Technology, Engineering, Math) careers. The Museum at Prairiefire administrates and funds the development and implementation of KCUA programming, resources, and partnerships to provide comprehensive, world-class STEAM (Science, Technology, Engineering, Arts, Math) experiences for students and educators throughout the greater Kansas City Metro where resources are scarce. Meaningful learning and engagement with science, culture, art and natural history is at the forefront of the Museum at Prairiefire’s efforts. Leveraging educational resources developed by the American Museum of Natural History as well as other renowned cultural institutions and scientists, the Museum at Prairiefire’s programs are deeply engaging and strive to inspire the next generation of scientists, naturalists, artists and engineers. Sound standards based education programs tie the Museum at Prairiefire initiatives directly into the classroom, driving student attendance and community involvement. The Museum at Prairiefire Education Team, directed by Dr. Kathryn McKinney, provides STEM and Project Based Learning expertise and facilitated educator support for all programs through Project Lead the Way, KC STEM Alliance and KC Urban Advantage. Museum at Prairiefire school field trips and educational programs support Next Generation Science Standards, Common Core, and Show-Me State Standards. Cross-curricular resources are available for all current and upcoming exhibitions as well as the Discovery Room and Great Hall. The Museum at Prairiefire has a unique opportunity to enhance the teaching of Science, Technology, Engineering, Art and Math (STEAM) topics throughout the community by offering vetted education programs, professional educator development and relevant lecture series, as well as other science and natural history programming for ALL ages. The MAP offers fun and dynamic programming such as Science Happy Hour (adult and curious young adult), Little Explorers Club (ages 3-5), Cinema + Science (all ages), JAM Sessions (elementary age), Paleo Rocks Camp and more all year. Thank you for your consideration in supporting the Museum of Prairiefire Foundation and KC Urban Advantage. Your contributions make a difference in the lives of underserved children and our greater Kansas City Community.